A copper mine in northwestern Arizona is shutting down production and laying of hundreds of workers in the wake of a Bankruptcy Court filing by its corporate owner. KINGMAN ai??i?? The longtime sheriff of Mohave County in northwestern Arizona has announced he's retiring. Gov. 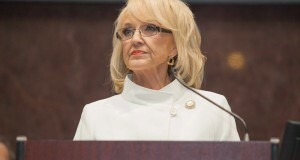 Jan Brewer plans to refocus the Medicaid expansion debate on mental health. In a press conference scheduled for Thursday at the Capitol, Brewer will join mental health professionals, advocates and patients to emphasize the impact that the governor’s Medicaid expansion plan will have on people with serious mental illness. Arizona Congressman Paul Gosar will be in Kingman on Friday for the grand opening of his district office.